1. Collect what you love. Unless you're a dealer purely collecting art to make money on it, art collectors can agree that it is ultimately about enriching your life with art. Whatever you decide to collect, buy art first and foremost because you love it and it makes you happy. Whether it is a painting from your travels, a quirky piece from your favorite local artist, or a richly handcrafted mug for you to drink your coffee from, collect what you love. That will look different for each person. You may find yourself unintentionally becoming a collector of paintings of doors because that is what you are drawn to! But for an art collector, art isn't just fluff, it's a deeply rewarding part of their life that is worth every penny. 2. Buy original pieces. While prints of paintings can be a more affordable way to enjoy the work of your favorite artists, they cannot really replace the original piece itself. There are some high-quality canvas prints available, but only the original will show every brushstroke that went into the work. Buy as many original pieces as you can afford, even if they're smaller. If your budget is small, watercolors, pastels, and ceramics can be a great way to get started collecting at a more affordable price point. Most collectors start out with a small budget, and then buy more expensive pieces over time as their budget grows. Unlike prints made from originals, original pieces can keep their value and even go up in value, depending on the artist. If your collection gets larger, you can cull your collection occasionally and sell original pieces that you have become less attached to in order to make room for new work. Also, if you do buy an original, make sure the artist has signed it. 3. Study the artist. If you're interested in collecting art as an investment, learn as much as you can about the artist and each individual piece. Buy a book about the kind of art you want to collect, Google the artist, talk to galleries and dealers, and visit and revisit the pieces. If it's a living artist, reach out to them and ask to visit their studio. Many artists would be happy to meet you at their studio and tell you more about their work. Once you learn about the artist and their work, then you will get a sense of which pieces could potentially go up in value over time. For example, rarer pieces are more valuable because they are harder to find. If a piece is much larger than everything else that artist painted, it could potentially have great value because there are no other pieces like it. 4. Find art from different sources. Galleries and art dealers are a great place to start when you art collecting art. Even if they do not currently have exactly what you are looking for, they know art and artists and can sometimes help you find it. Galleries are not the only place to buy art, though. For more well-known artists, there are art auction houses such as Neal Auction Company where you can find higher-end art and more hard-to-find pieces. (Make sure you set a limit for yourself before you go to an auction, though!) You can even buy art on eBay, but you have to be careful about sellers being dishonest. For example, sometimes sellers on eBay claim that a piece is by a different artist than who actually did it. Events and shows like Fired Works, which just took place last week, can be a wonderful place to see a lot of work by different artists, discover new artists, and find pieces you love. If you visit the artist's studio, you can also buy artwork directly from the artist. Sometimes artists have work in their studio that is "seconds," which means work with minor defects, that you can purchase at a lower price than what it would normally be worth. 5. Use your art collection. If you collect handmade ceramic mugs, use your mugs. Just because they are art does not mean they have to sit on a high shelf to never be touched. 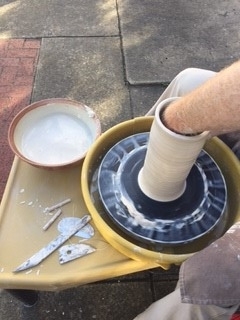 Pottery, in particular, is meant to be handled to be enjoyed. Using original pottery changes your experience of food and drink. If one of them breaks, then you have an excuse to buy more pottery! It will enrich your life so much more to use your pottery or hand-blown glasses in your daily life than to only look at it. Hang your paintings where you can enjoy them. If you have an oil painting that does get damaged, it can be repaired by a professional. The important thing is that your art collection is part of your life. The 567 Center for Renewal is dedicated to serving the community through the arts. With this ambition, The 567 Center for Renewal offers a variety of art classes for both beginning and intermediate skill levels. 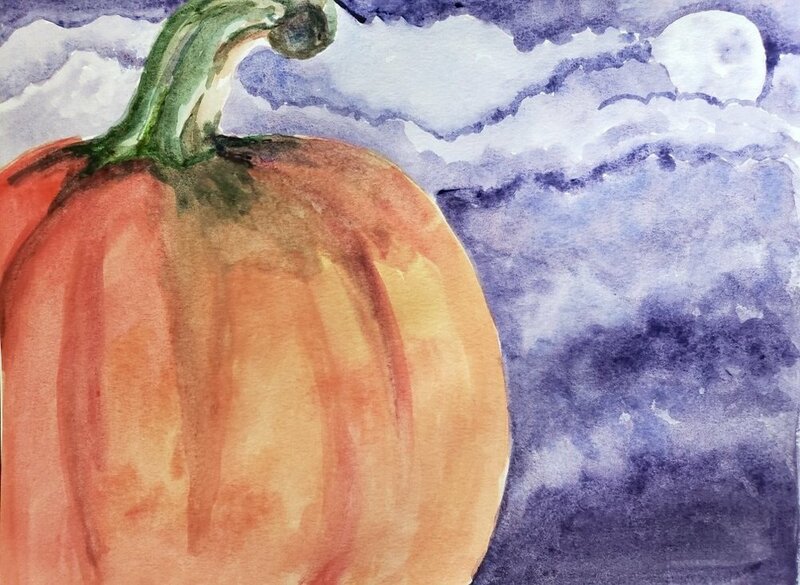 The fall art class schedule for 2018 includes classes for both youth and adults. Upcoming classes with availability include Corks & Canvas, Kool-Aid & Canvas, Coffee & Canvas, Drink & Ink as well as Watercolor & Wine. We have additional classes in October which include oil painting, jewelry making, and photography. The artists that teach our classes are trained professionals who are active in their fields of study. This ensures that you get the service you deserve as you enjoy a creative night out. If you are interested in joining one of our classes, please visit our art classes page to enroll! We are excited to offer these opportunities to our community. With connecting our community with creative outlets, we hope to make a positive impact that spreads beyond our walls. 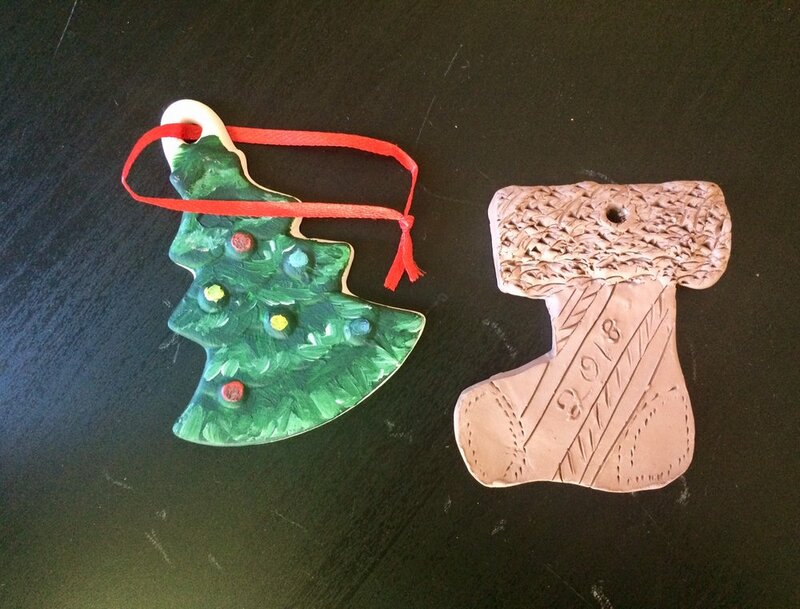 In addition to our regular class schedule, we also offer pottery classes as well. Please feel free to contact us with any questions you may have! We are looking forward to this new season. We had an incredible time celebrating fine art and tasty wine on September 15. With partnerships around our community, we were able to bring local artists together to exhibit on the streets of downtown while participants had the opportunity to join in on wine classes. In addition, we had our traveling art cart available with paint and canvases for anyone with a creative inkling to create their own masterpiece. While the Art and Wine Festival was the main event, we also had the opportunity to help others in need. Through our partnerships, we were able to host a fundraiser for the non-profit organization Loaves and Fishes. This fundraiser was something that took weeks of planning as we held a class to create the pottery that was sold during the event. Our pottery students created bowls solely for this purpose. The Empty Bowl fundraiser is a national sensation as many creative groups have used this concept to raise money for food banks and charitable organizations. 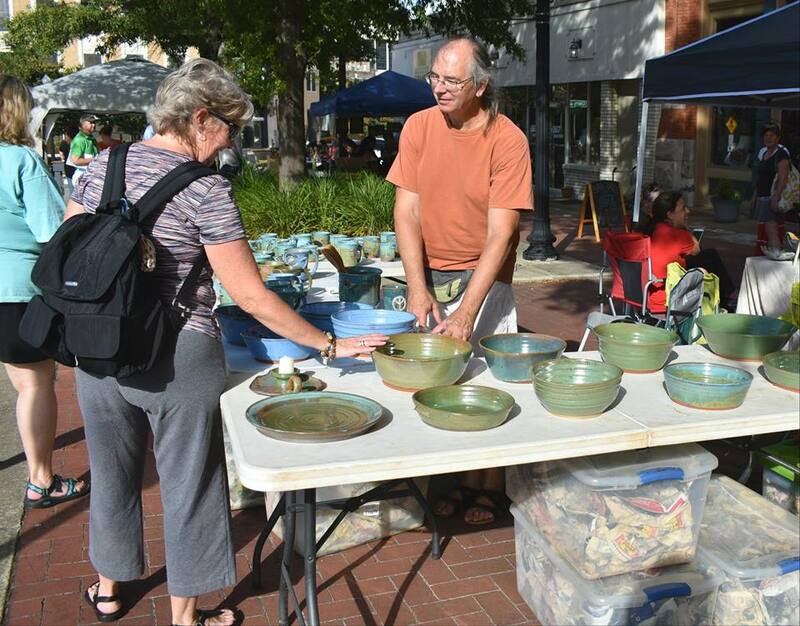 The idea is that the patron purchases a handmade bowl and then receives a bowl of soup, the catch phrase empty bowls and full hearts may come to mind. 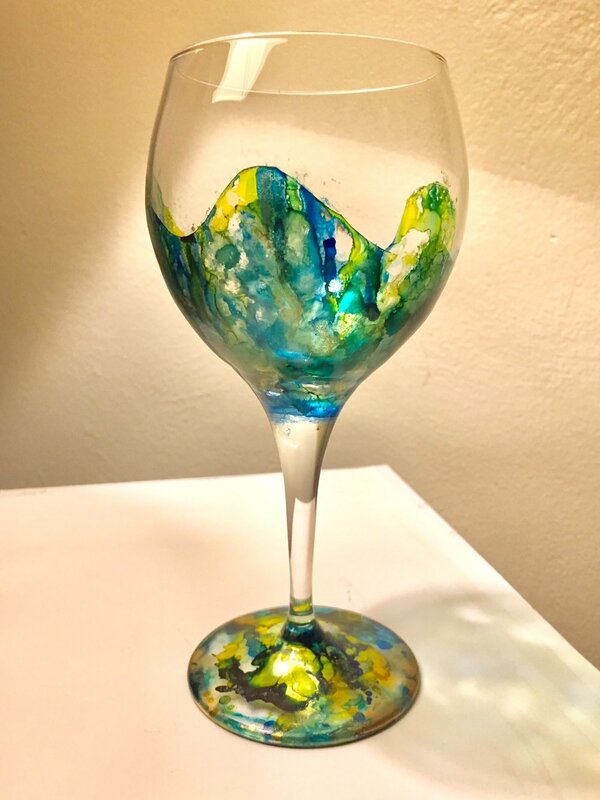 In addition to the fundraiser, we also held a Wine Glass Painting Class. This was perfect for those participating in the Empty Bowls fundraiser because they could paint their glass and as it was cooling from the fire they could enjoy a delicious bowl of soup! We want to say thank you to all who supported this event! We could not have done it without you! Thank you for helping us connect to our community through the arts. The 567 Center is thrilled to receive a Downtown Challenge grant for "Art on a Cart." This project is one of 21 ideas that were chosen to be funded in the latest round of Downtown Challenge and announced last night by the Community Foundation of Central Georgia. 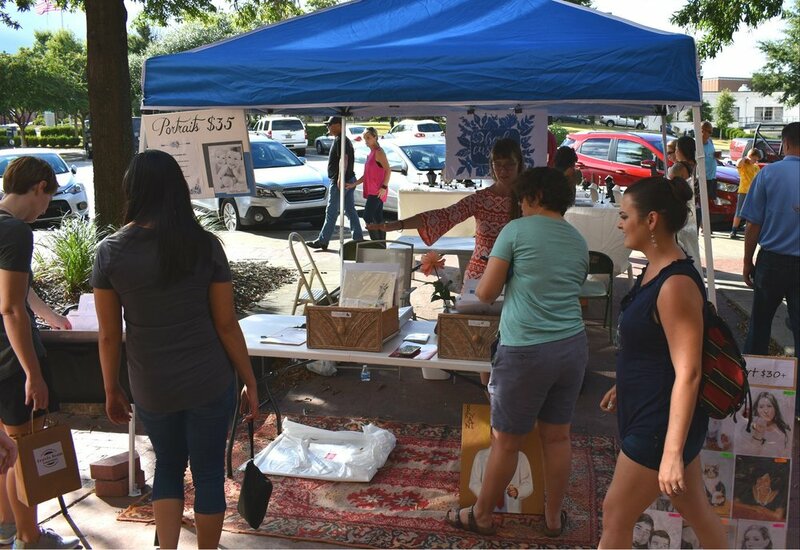 Starting in January, The 567's mobile art-making cart will pop-up monthly in various medians, alleys and plazas in downtown Macon with free art activities guided by local artists. The activities will be open to both kids and adults, and could include pencil sketching, clay, acrylic painting, and watercolor, to name a few. We look forward to taking some of the fun of our art classes out into the streets of downtown! The Art Cart will also be a great opportunity to give new enjoyment to some of the beautiful and unusual public spaces that give downtown Macon its character. The mission of The 567 Center is to bring creative life to downtown Macon, and the Art Cart will definitely do that. Check out some of the other great projects being funded by the Downtown Challenge in this article in the Telegraph. The 567 Center is excited to offer Work of Art: Business Skills for Artists this fall as part of its Amplify program. The 12-week workshop series will start September 20. Work of Art is a professional development curriculum designed to teach business skills to artists in all disciplines — visual, performing and literary arts. Artists can take the whole series or individual workshops that best suit their needs. Developed by Springboard for the Arts, this series has been taught at arts organizations around the country. Workshop topics include marketing, social media, time management, business plans, pricing and more. Each workshop will be led by a different local artist who will bring their own experience and expertise to each topic. The goal of the Amplify program is to help creative professionals build a life by doing what they love. The 567 Center presented its first Amplify workshop, Amplify Your Creative Business, during Macon Startup Week in April. Since then, other workshops have included Wordpress Basics, Etsy Success and Artist Profiles. The Work of Art series is the perfect continuation of these workshops. In addition to workshops, members of Amplify receive one-on-one consultations and access to special news and networking opportunities. The 567 Center hopes to build a network and support structure through Amplify that connects creatives both to each other and to the resources available in the community. For more information about Amplify or to register, visit the567center.org/amplify, call 478-238-6051, or e-mail Executive Director Melissa Macker at melissa@the567.org. 1) Visit a museum. We have a few museums downtown. If you appreciate downtown's historic architecture, you must visit the Hay House and the Cannonball House. The Hay House is a 18,000-square-foot Italian Renaissance Revival style mansion that has been featured on A&E's "America's Castles." The Cannonball House was built around the same time and has some interesting Civil War history. Sports fans will enjoy the interactive and educational exhibits at the Georgia Sports Hall of Fame. For art lovers, check out the Tubman Museum. It is the largest museum in the Southeast that is dedicated to preserving and sharing the story of African American Art, Culture, and History. Their new building at the end of Cherry Street is big and beautiful and well air-conditioned, so you can spend a while here. 2) Travel by bike. What better way to see downtown from a different angle than on a bicycle! Thanks to Macon's bike share program, you can pick up a bike in front of the Tubman Museum and rent it using an app on your phone. If riding along the Ocmulgee River is more your pace, you can also pick one up at the Spring Street entrance of the Ocmulgee Heritage Trail (also known as "the river walk" to locals). You can learn more about the bike share on the Macon CVB's website. 3) Enjoy a self-guided tour of downtown. Downtown has a range of new and old pieces of public art, from statues to murals. Unlike statues, murals tend to change, get painted over, or pop up suddenly, so this map of public art is a little out of date, but it's a good starting point. You may discover new murals on your way! If you stop into the Macon Visitors Center at 450 Martin Luther King Jr. Blvd., you'll find many more self-guided tours and suggested itineraries. 4) Explore downtown Macon's art galleries. If you've visited the galleries on First Friday, they're full of people mingling and enjoying the festivities. During the week, the galleries are quieter, which gives you a chance to really step back and appreciate the work at a leisurely pace. The staff (us included) usually love visitors and are happy to give you the low-down on what's happening downtown. Our hours are 11 am-4 pm, Monday-Friday, and we'd love for you to see our artwork in person. Other galleries to visit: Macon Arts Alliance, Travis Jean, Gallery West, and Ampersand Guild. Bonus: visiting the galleries is free! 5) Try a new restaurant. As downtown Macon grows, so does its culinary scene! Use your time off to check out a restaurant you haven't tried yet--several have opened up just this year. While you're visiting the galleries, the Red Rooster is a great lunch spot. Make sure you leave room for one of their delicious desserts (you're on vacation, after all!). Other places that have opened (or re-opened) semi-recently: Tzango at Lanier's, La Bella Morelia, Ginger, Ladda Bistro, Sang's Thai Isaan Restaurant, Piedmont Brewery & Kitchen, and Ocmulgee Brewpub. Bonus: grab yourself some ice cream at Cherry Street Scoops while you're wandering around. 6) Get the low-down on Macon's music history. Downtown Macon's streets were once frequented by many famous musicians who got their start here. When the sun sets, Rock Candy Tours can tell you many stories and fun facts as you stroll through downtown. 7) See a band--or a play. It's hard to throw a stone downtown on the weekend without hitting a musician. From restaurants to bars to venues like Fresh Produce Music Hall or Cox Capitol Theater, there's something for every musical taste almost every night of the week. You can also see a play or a variety of other performances at Theater Macon, Douglass Theatre, or Grand Opera House. Ovations365.com is a great resource for many events happening in our area. 8) Learn to paint. If you've never been to one of our paint nights, you need to try it at least once. Even people who think they don't have a shred of artistic talent are surprised what they can create with a little help. Plus it's super relaxing (especially if you bring your own wine!). Depending on the night, you can choose from Corks & Canvas (with acrylic paint), Watercolor & Wine, or Drink & Ink (which is like doodling with watercolor added). 9) Float down the Ocmulgee. When you need to beat the summer heat, there's nothing like getting wet. This isn't exactly downtown, but most floats start at Amerson River Park and end up at the Spring Street ramp (which is basically downtown). If you want to travel by kayak or canoe, Ocmulgee Outdoor Expeditions will take good care of you. Leave your cell phone and worries behind and enjoy the scenery. 10) Go shopping. No vacation is complete without shopping--or at least buying a souvenir. If you haven't already picked up something for yourself at one of the galleries or museum gift shops, there are plenty of cute shops to peruse downtown. You're sure to find something! Buy a rare book at Golden Bough, find the perfect accessory for your home at Nest, or make an impulse purchase on a like-new dress from Wear. There are other boutiques to check out, too! 11) Bonus: stay in a B & B. If you have the money and want to splurge on the complete vacation experience, stay at the 1842 Inn. This historic home has thought of every detail. It's right downtown, but it's so relaxing you may not want to get out and explore! MACON – As a way to help creative professionals build a life by doing what they love, The 567 Center for Renewal is offering a professional development program for artists and designers in Central Georgia. The program, called Amplify, will support entrepreneurs with resources, training and networking opportunities to advance their careers. Amplify was first developed by Macon Arts Alliance in 2014. After a successful couple of years, Macon Arts decided to pass the program on to The 567 Center for Renewal. Amplify Your Creative Business, the first Amplify workshop presented by The 567 Center, took place during Macon Startup Week in April. Upcoming workshop topics will include how to sell what you make on Etsy, starting a website using Wordpress, and social media marketing. In addition to workshops, members of Amplify receive one-on-one consultations and access to special news and networking opportunities. The 567 Center hopes to build a network and support structure through Amplify that connects creatives both to each other and to the resources available in the community. By supporting creative entrepreneurs in the growth of their business, the program is expected to ultimately create more jobs in the creative industries in Macon. For more information about Amplify, visit the567center.org/amplify or call 478-238-6051. For the month of May, The 567 Center will feature artwork by Savannah-based artist Brian Antoine Woods in an exhibit titled, “Return of the King.” The exhibit will include paintings, drawings, ceramics and mixed media works by the artist. Even though a range of artwork will be included in the exhibit, there are common themes in Woods’ work. As an African-American artist, Woods draws heavily on concepts such as slavery and the black experience. Images of cotton and black hands are in many of his works. To the artist, though, these images are only symbols of something deeper. He chose the title of this exhibit, “Return of the King,” to refer to the rise and fall of oppressive institutions throughout history. It is also a nod to the moniker “King Cotton” which was used by pro-slavery authors and politicians in the 19th century. The term identified those in the cotton industry as the new ruling class in the antebellum South. Like many artists, though, Woods sees his work as open to the viewer’s interpretation. Ranging from scenic landscapes to abstract forms, his artwork is subtle in its presentation. “Orphans of Tulsa” is a collage that shows dark figures in a field of strawberries while old war planes fly overhead. At first glance, it is difficult to tell whether the figures are children playing leap frog or field hands harvesting the fruit. In another piece titled “The Black Vote ‘No’,” black hands appear intertwined in a dance with a branch of cotton. A longer look reveals that the word “no” is spelled out in the outline of the hands. The artist will talk about his works and what inspired them in a brief artist talk on May 5, 5:30 pm, at The 567 Center. The artist talk will be followed by a reception with the artist until 9 pm. Both events are free and open to the public.